Yeah its wine making time again. The trees are changing color and that is a signal to start making wine with our favorite grapes and juices during the short time we have them available to us in Calgary. In the old days it was acceptable to just crush and leave the grapes out to catch wild yeasts and hope for the best. Now a days though tastes are more refined and vintners are able to make wines that rival the great Chateaus of Europe thanks to a few simple tools and a bit of science. To that end The Vineyard offers up a few items to help you with your home lab. Hydrometer: This simple device determines the amount of sugar in your juice or must simply by floating it in a sample or the fermenter. By using a hydrometer you can tell the potential alcohol of your must and chapalize (add sugar) or dilute as needed. Hydrometer reading done on a regular basis also help you monitor fermentation and take corrective actions if needed. Sulphur Test Kit: This allows you to easily measure the free sulphur dioxide levels of your wine, juices and metabisulphate powders at all stages of winemaking. It will help you prevent over or under sulphiting especially during racking and before bottling. Oversulphiting prevents fermentation and damages the bouquet and flavour. Undersulphiting can damage flavor and reduces the ability of your wine to age. The test kit comes with a great sheet written in laymans terms on how to use. Acid Test Kit: This is designed to measure the Total acidity (Ta) of the must or wine. Results are expressed in terms of percentage of Tartaric Acid or grams per litre. 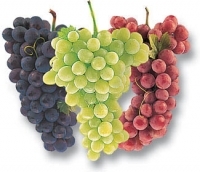 Generally you want 6 -7 g/l in red wines and 7 – 8g/l in white wines. To adjust acid up you can add tartaric or acid blend. You can also blend high acid grapes with low acid grapes. To adjust acid down you can again blend grapes, add precipitated chalk and or water. Malolactic Cultures: These are a bacteria that convert harsh malic acid into softer lactic acid and C02. The primary reason for using malolactic fermentation is to reduce acid in red wines and some selected white wines by organic rather than chemical means. Typically both red and white grapes grown in B.C. are characterized by low pH and high TA, both in combination indicating that the malic acid is probably higher than the tartaric acid. The chances are that if it is not used under controlled conditions, it will happen spontaneously, usually after the wine has been bottled. Wines that have undergone malolatic fermentations should not be sorbated as a renewed malolactic fermentation will product Geraniol (makes your wine smell like geraniums). The Vineyard carries Wyeast Liquid Malolactic blend that is excellent for the home vintner as it works well across a large pH and temperature range. Each package is designed to inoculate 23l of wine, for larger quantities of wine you can use multiple packages or do a starter using unpasteurized apple juice. Liquid Yeast Cultures: While there are some excellent and inexpensive dry yeasts out there I find that the liquid yeast cultures allow you to bring out the varietal expressions in your wine. With good quality grapes or juices you will produce a wine that rivals many of the best Chateaus in Europe. Like the malolactic strains these are prepackaged in the activator pack that does a small starter to pitch into 23l of juice or must. For larger amounts you use multiple packages or do a starter with juice to increase the amount of yeast. We fly our liquid yeasts into Calgary in a special cooler pack on average of twice a month so if your interested in a yeast strain that we do not have here then contact us by phone or email and we will add your strain to our next order and let you know when it is in stock. The yeast is packaged in a way that they stay viable under refrigeration for up to six month. For a full list of available wine strains click here. When using liquid yeast culture you will notice that they take longer to start and finish as compared to their dry cousins. Remember to use your hydrometer to test and be sure you are within the ranges as outlined in your kits instructions before racking off the yeast.